A team of researchers led by MSD's Feng Wang has developed a simple method that could turn ordinary semiconducting materials into quantum machines – superthin devices marked by extraordinary electronic behavior. The Ultrafast Materials Sciences program at MSD has discovered that the presence of strong spin orbit coupling in cuprate superconductors gives rise to a new form of spin momentum locking that goes beyond the standard Rashba picture. The In-Situ Liquid Cell Electron Microscopy program at MSD has verified that classical dendrite growth theories are applicable to the nanoscale. A new Energy Frontier Research Center (EFRC), led by MSD's Joel Moore, will build on unique Lab capabilities and expertise in quantum materials and quantum coherence to develop new approaches to quantum information science and technology. The Magnetic Materials program at MSD has visualized magnetic ground stats and "order-by-disorder" phenomenon in nano disk arrays. The Structure and Dynamics of Materials Interfaces program at MSD has determined knowledge of the structure and composition of nanometer-thin solid-liquid interface regions is key for understanding wetting, corrosion, membranes, and electrochemical phenomena. 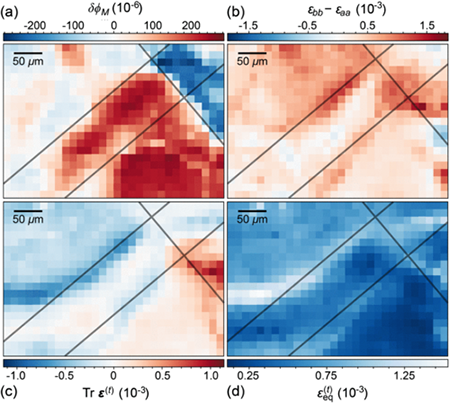 Revealed nematic domains in an Fe-pnictide superconductor using multimodal imaging (optical and X-ray).